This is a variation of Socca. It is the easiest flatbread you can make. It’s always a delightful surprise to see the liquid batter come out of the oven as bread after baking. Most of our recipes here are gluten-free. Check them out at the RECIPES tab above. 1. In a large bowl combine the flour and spices (garlic, parsley, rosemary, pepper flakes, salt, and pepper) with a whisk until fully incorporated. 2. Add the water one half cup at a time and let the mixture set for a couple of minutes between each 1/2 cup. The amount of chickpea flour to water always varies depending on the grade of flour. When the batter is the consistency of heavy cream, let set for about 10 minutes. 3. Grease a 9×13 inch sheet pan with at least a 1 inch depth and line the bottom with parchment paper. Pour the batter into the prepared pan and bake for 15 minutes, or until the bread is brown on the edges and firm in the center. 4. Let cool before cutting into the desired shape. This bread keeps 4-5 days in an airtight container in the refrigerator. Reheat it in a 250 degree oven until it is warm to touch before serving. For thicker flat bread use an 8×10 inch Pyrex pan prepared the same way (greased and lined with parchment paper). We are here to help. Let us know if you need a specific recipe and perhaps we can come up with it for you. I don’t know what all your daughter’s allergies are and I know in this world it can be overwhelming. Garbanzo flour is amazing. We have many gluten-free recipes. This pizza crust recipe is one of my favorites: https://responsibleeatingandliving.com/?p=6148. Parchment paper is essential! It will not stick. If you can’t find it in a nearby store you should be able to buy it online. This bread is delicious! But I feel it should be “dipped” in something. I don’t know what. Someone mentioned dipping in into a lentil stew. Mine came out kind of “spongy” because I used the wrong size pan. Had to bake it for 30 minutes instead of 15. It should be dipped! 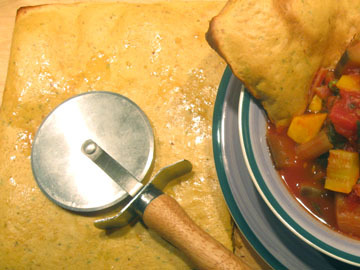 And when we posted this recipe we dipped it in Summer Vegetable Stew, recipe: https://responsibleeatingandliving.com/?p=2238. The more you make it the more you will see what works best for you. Try this variation we call Soccacia: https://responsibleeatingandliving.com/?p=6397 or this one for Socca: https://responsibleeatingandliving.com/?p=2113. Couple of weeks ago I saw a recipe for gluten free bread made with garbanzo flour, millet flour , potato starch and psyllium powder I have tried to find the page again to no avail, would you know anything about this recipe. Obviously I made a mistake because what came out of my oven smelled bad and tasted worse. I rechecked the recipe and I think I followed it. This thing I made…well, I wouldn’t call it “bread”. In fact, I don’t think I wish to name it. It now resides in my waste can. I hope it doesn’t know how to crawl. On second thought I’ll put it outside. The good news is that no one was injured in the baking of it. Sorry to read that you had a problem with our recipe. We make it all the time and love it. I can’t imagine what you did so that it didn’t work out. What kind of chickpea flour did you use? What brand was it? It’s a flatbread, which is very thin, like thin pizza dough. What were you expecting? So sorry, Jo, that you are having trouble with this recipe. We have made it so many times and just love it. It should be a thick batter, not a dough. Perhaps your oven and oven temperature work differently. Try a cooler bake temperature for a longer time. That should prevent the sides from burning and give the middle a chance to firm up. I made this last night and it came out fine. I put a lot of seasoning in it but it still needed more, next time I’ll try some cumin. Is there a reason you don’t put oil in this recipe? I noticed that most of the other chickpea bread recipes have olive oil in them. We try and minimize the amount of oil in our recipes because oil is not a healthy food. We recommend getting fat from whole foods like avocado, raw nuts and seeds. We do use oil in some of our recipes, but they are mostly treats for special occasions. We encourage people to dry saute or saute with water rather than oil. You can add oil to this recipe if you want to. I also like using different seasonings. Coriander and cumin are excellent. Fabulous and easy!!! I only had a very large cookie sheet that wasn’t committed to other food creations, so I generously oiled it with coconut oil (no parchment paper left as that was used up on the granola) and poured on the batter. The flatbread cooked for 12 minutes, cooled for just a couple, and then I cut in into attractive rectangles. Hubby and I loved it with our roasted garlic hummus. Came right off the cookie sheet too. It’ll become a pizza crust next time. Thanks so much! We love comments like these! Please take a look at our other recipes on our website, many with garbanzo bean flour as well as other gluten-free flours. A great treat for low carb dieters (I’m doing South Beach Phase 1 after Thanksgiving glutony to shed holiday pounds as well as quite a few stress pounds I’ve put on over the last year). Because it’s so high in fiber and low in sugars, this makes this flatbread a-OK for phase 1. We’re having taco soup for dinner so instead of your Italian flavors, I used cilantro, garlic and a little brine from jarred jalapenos in place of about 1/8 of a C of water. DEELISH! Can’t wait to try with your spice/herb combo! Wondering if you’ve come across a ‘potato bread recipe’ that is gluten free? There’s a bakery about 40 min away that makes the most heavenly loaf… but the retailers near us charge EIGHT DOLLARS a loaf 🙁 There must be a way to avoid it… and not have to resort to eating dust (or bricks) posing as bread. There’s a potato recipe in Nicole Hunn’s Gluten-Free on a Shoestring Bakes Bread that looks simple – gluten-free all purpose flour, yeast, water salt and potatoes. The recipe is right here on this post. And we have hundreds of recipes here on our website, all free. Most of our baked goods recipes are GF. Made this today and loved it. Even my husband liked it which is amazing because he is usually against any kind of restrictions in his diet. I am very pleased to find this recipe. I have lupus and am reducing inflammation through my vegan diet. Wheat causes a major inflammatory response (I know this because I “test” .common foods to see how I respond) and has now been eliminated from my diet altogether. The problem? I LOVE bread. I’m going to make this and use it as a focaccia topped with veggies. I plan to make it tomorrow. Let us know how it came out! We have hundreds of gluten free recipes here on our website. It turned out great! It really satisfied my cravings. It works well as a sandwich bread – I added assorted, sliced veggies – or plain. I made some for my father, too and he LOVES it. I am making more right now to go with my vegetable soup. Hi. I really want to try your recipe but I live abroad in Asia and haven’t been able to find chickpea flour. Can I use canned chickpeas instead? There was a brownie recipe I saw once that used canned garbanzo beans and it looked great. Wondering if that would be possible with this recipe. Thank you. You can. You can make your own chickpea flour from dried chickpeas and grinding them in a food processor, sift off the larger pieces. You can finish those in a spice grinder. I have not tried using can chickpeas but it should work. I would rinse and drain the chickpeas as much as possible and then puree them in a blender or food processor. Add enough water to make a thick mixture like heavy cream. Do not add the additional water in the recipe. Let us know how it comes out!